Encouraged by Isaac Stern, Shirly Laub was the winner of several competitions for young musicians before she studied at the Brusssels Conservatoire with Clemens Quatacker and Philippe Hirshhorn and later at the Utrechts Hogeschool with Wiktor Liberman. In 1997 she won the title of Soloist of the Community of French-speaking Radio Broadcasters and in 2001 she was awarded as Juventus laureate by the Council of Europe. Between 1998 and 2005, Shirly was one of the leaders of the Royal Philharmonic Orchestra in London and since then is regularly invited as guest leader by the Orchestra of Covent Garden Opera House, the BBC orchestras and various spanish, belgians, french, dutch and korean symphony orchestras. In 2001, she joined the Silk Road Ensemble, performing chamber music worldwide with Yo Yo Ma. She has given broadcast recitals in Belgium, Italy, UK, France, Switzerland, Canada and records for Explicit! and Fuga Libera. 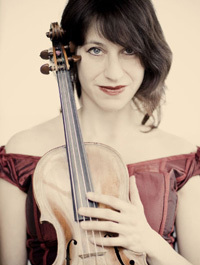 Shirly is a member of the string trio Triofenix and is the first violin of the Belgian chamber ensemble Oxalys since 1993, playing in prestigious concert halls such as the Concertgebouw in Amsterdam, the Philharmonic hall of St Petersburg and the Library of Congress in Washington. Besides the masterclasses she is giving in places such as Madrid, London and Tokyo, she is a Violin Professor at the Royal Brussels Music Conservatoire.